It is requested that Inspector Geo. O. Wilson be authorized to incur per diem for ten days to conduct this investigation. 1. 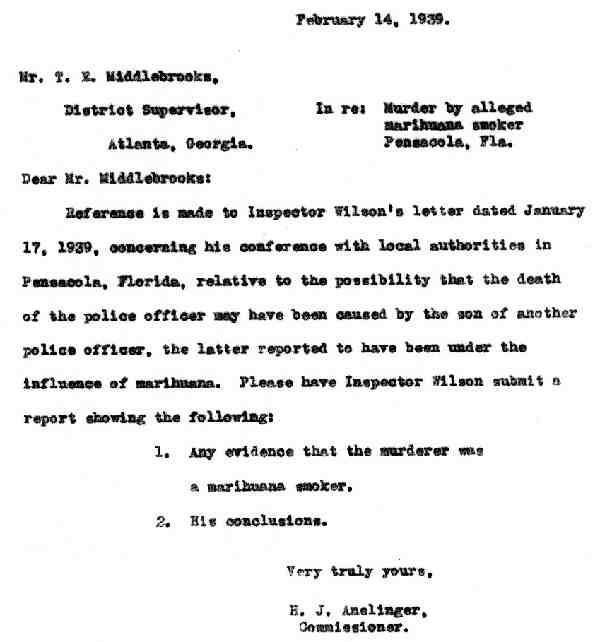 Reference is made to a conference with Chief of Police O’Connell, and Mr. Jack Maher, Member Police Committee, Pensacola, Florida when this officer was in Pensacola January 15, 1939. 2. The conference was at the request of the city officials mentioned above, for the purpose of discussing alleged marihuana violators in the city. 3. The was the result of the death of a police officer and the son of another police officer on that date. 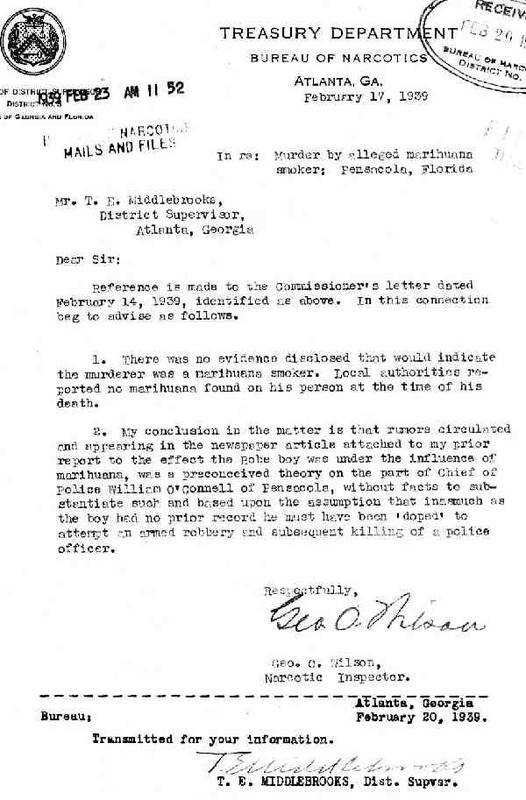 The Chief of Police attributed such deaths to the smoking of marihuana cigarettes by the son of the police officer who had attempted a hold up and in the course of such crime killed a police officer and was subsequently killed by another officer. There is attached hereto the newspaper article which is self explanatory in this connection. 4. The city officials requested that our Bureau initiate a thorough investigation in Pensacola of alleged violations of the Marihuana Tax Act. The officials were advised that this writer would submit a report of the information furnished to my superior officer. 5. 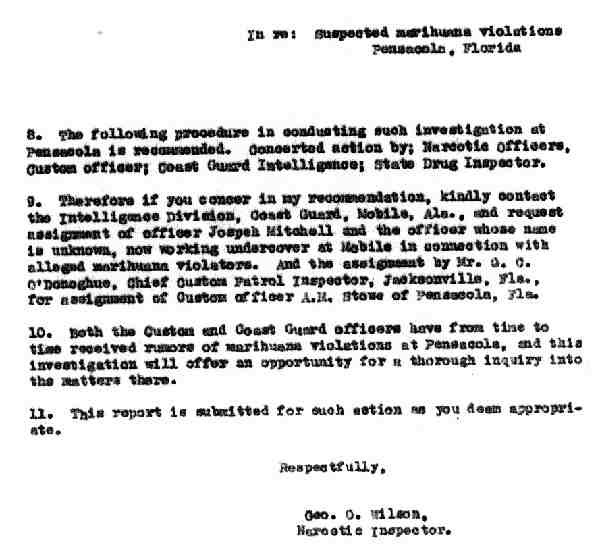 During the past few years this writer has visited Pensacola there has been no complaint received that marihuana was being peddled in that city, and to my knowledge this is the first complaint to our Bureau. 6. The Chief Police furnished this writer fifteen names of suspected dealers in the illicit marihuana traffic, or users in Pensacola and vicinity. 7. For the purpose of ascertaining whether there is traffic in marihuana in Pensacola, it is the suggestion of this writer that a through investigation be conducted. It is my opinion we should be in position to ascertain something in this connection within a period of ten days, and if such preliminary investigation discloses violations that require more time to complete, authority for additional time may be requested. 8. The following procedure in conducting such investigation at Pensacola is recommended. Concerted action by; Narcotics Officers, Custom officer; Coast Guard Intelligence; State Drug Inspector. 9. Therefore if you concur in my recommendation, kindly contact the intelligence division, Coast Guard, Mobile, Ala., and request assignment of officer Joseph Mitchell and the officer whose name is unknown, now working undercover at Mobile in connection with alleged marihuana violators. And the assignment by Mr. G.C. O’Donoghue, Chief Custom Patrol Inspector, Jacksonville, Fla., for assignment of Custom officer A.E. Stone of Pensacola, Fla.
10. Both the Custom and Coast Guard officers have from time to time received rumors of marihuana violations at Pensacola, and this investigation will offer an opportunity for a thorough inquiry into the matters there. 11. This report is submitted for such section as you deem appropriated. 1. Any evidence that the murderer was a marihuana smoker. 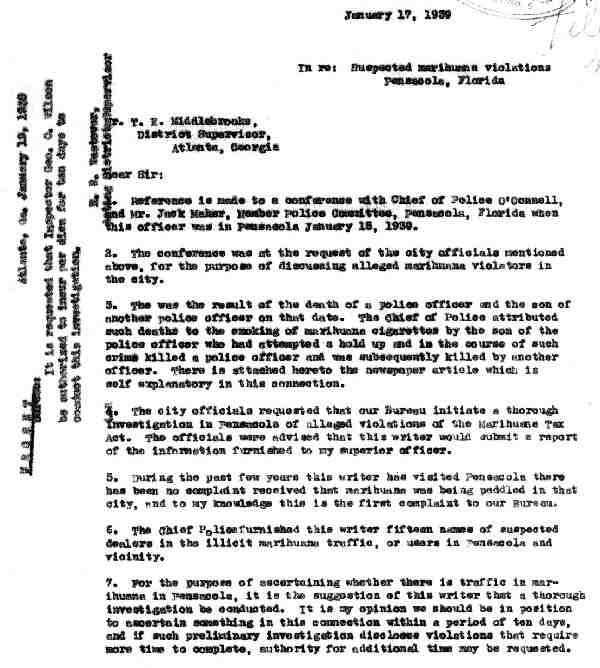 Reference is made to the Commissioner’s letter dated February 14, 1939, identified as above. In this connection beg to advise as follows. 1. There was no evidence disclosed that would indicate the murderer was a marihuana smoker. Local authorities reported no marihuana found on his person at the time of his death. 2. 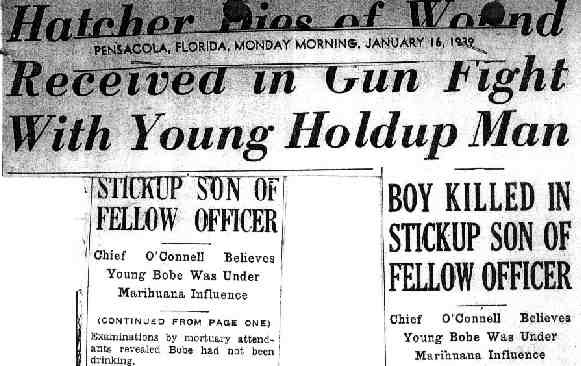 My conclusion in the matter is that rumors circulated and appearing in the newspaper article attached to my prior report to the effect the Bobe boy was under the influence of marihuana, was a preconceived theory on the part of Chief of police William O’Connell of Pensacola, without facts to substantiate such and based upon the assumption that inasmuch as the boy had no prior record he must have been ‘doped’ to attempt an armed robbery and subsequent killing of a police officer. T. E. MIDDLEBROOKS,	Dist. Supvsr.